A. What is foster care? Foster care is a program run by the state of Virginia that provides temporary care for children who cannot live with their parents or family. The local department of social services takes legal responsibility (called legal custody) for a child when that child’s parents need help taking care of him or her. Most children placed in foster care live with families (called foster families), but some live in group homes or other “residential homes.” These may be like a school and provide medical or mental health treatment for children. B. Why am I in foster care? It is not your fault you are in foster care. Your parents were not able to provide you with a safe living situation, and a group of people, including social workers and a judge, decided you needed to be placed in foster care. If your parents (or the caregivers you were living with) have problems that keep them from being able to care for you right now, they will get help. If they can solve their problems, the judge will send you home—as long as you will be safe there. C. Who decided to put me in foster care? A judge decided you should be placed in foster care after hearing from your parent(s), other caregivers, social workers, a GAL, and other people. A social worker only asks the judge to place a child in care if he or she cannot come up with any other way for the child to be safe. Often, a child is placed in foster care after the parent(s) or other caregivers have received help for their problems but haven’t been able to solve them. Sometimes, parents decide they need to put their child in foster care while they get help to learn how to take better care of their child and keep their child safe. The different court hearings can be confusing. 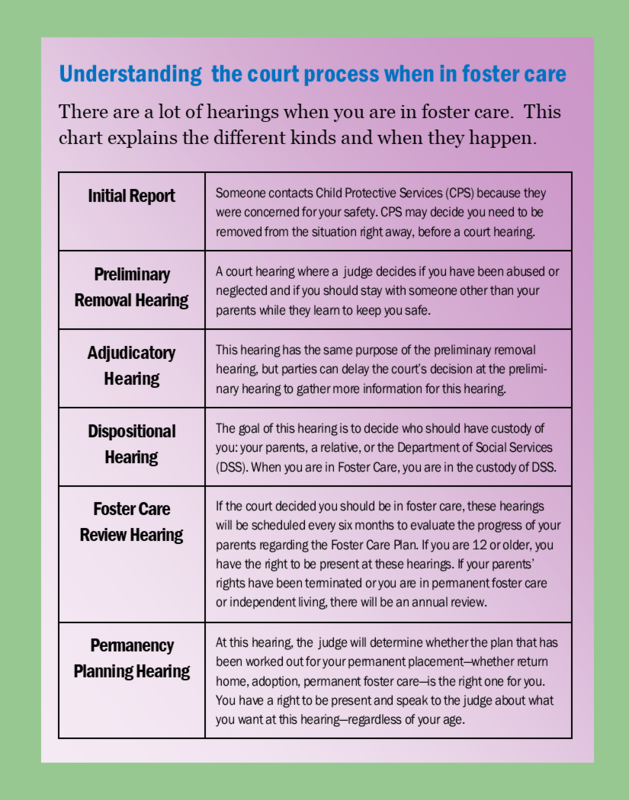 This chart called “Understanding the Court Process When in Foster Care” can help. D. What are the different kinds of foster care? Family foster homes: When you are in a family foster home, you live with a family in their home. While you are living there, you should be treated like any other member of the family. Independent Living arrangements: Some older teens may be an apartment, a group of apartments or a small home where older youth can live without constant adult supervision. These are for youth who are at least 18 years old, or for youth in the U.S. as a refugee or through asylum. ▪ Most youth in Independent Living arrangements are enrolled in college or vocational training or are employed, and receive an Independent Living stipend. Residential homes: Finally, some youth who have special health needs and cannot be adequately cared for in a family home live in a residential facility where they can get proper treatment. E. How often does the judge talk to my parents, social worker and GAL about my case? Hearings to review your case must be held at least once every six months. Your parents, social worker, and GAL attend every hearing. You have the right to get notice of and attend the hearing if you are 12 years old or older; even if you are younger than 12, tell your GAL and social worker if you want to attend. -For older youth who are working towards a goal of Independent Living rather than being placed with a family, or whose goal is permanent foster care, there is only one court hearing each year. -Between the court hearings, there is an administrative panel review (APR), which is like a court hearing, but without a judge. You also have the legal right to be at the APR and to have your concerns heard. -If it is a “permanency hearing” (to decide what your permanent living situation should be), you must be present, no matter your age. F. Who tells the judge what I want? Before the judge decided to put you in foster care, a lawyer was assigned to represent your interests. That lawyer is called a guardian ad litem (GAL). Your GAL is responsible for telling the judge what he or she thinks is best for you. This may not be the same as what you want. However, always let your GAL know your wants and concerns. Your GAL is responsible for telling the judge about these. ▪ If there is another adult you would like to have involved in making decisions, let your social worker and GAL know. ▪ YOU can also tell the judge what you want. The judge can hear from you in court, or in his or her private office (called “chambers”), away from everyone else. Let your GAL know if you want to speak to the judge in court, or privately in chambers. G. What is a foster care service plan? Your social worker, along with others, including your parents and other care-givers, work together to create a plan for you. The plan includes things such as what school you will attend, and what services you will receive. The plan must be approved by a judge. If you are 14 years old or older, you can participate in writing the foster care service plan; by law, you must receive a copy of the plan if you are 12 or older. Even if you are not yet 14, ask your social worker or GAL about attending the plan-writing meeting. If there is another adult you trust, you may ask them to help create your plan. H. What are the roles of the people involved in helping me? I. How often can I visit with my biological parents and siblings while I am in foster care? You have the right to visit regularly with your parents and any brothers or sisters who are not living with you while in foster care. How often depends on what your social worker and GAL recommend and what the judge orders. You may communicate with your siblings through phone calls, texting, and emails as well. Your visitation schedule is also in your foster care service plan, approved by the judge. If you are not happy with your visitation schedule, tell your social worker and GAL. J. Who decides if I can go on field trips, play sports, get my hair cut or have a phone while I’m in foster care? You have the right to live as normal a life as possible while in foster care. Your foster care plan may spell out who makes the decisions about what freedoms you can have. School activities: Ask your foster parents, social worker, and GAL about getting permission for sports and field trips. Clothes: Your foster care plan includes a small allowance, paid to your foster parents, for new clothes as needed. Talk to your foster parents if you need new clothes. If your foster family doesn’t help you to buy clothing, contact your social worker or GAL. Phone, computers: Whether or not you can get a cell phone, computer, or other devices depends on your foster care plan. Talk to your social worker or Independent Living coordinator. The rules for using devices may depend on the house rules of your foster family or other living situation. K. Can my foster care placement change if I don’t like it? Sometimes a particular foster family is not a good fit for a particular child. It’s normal to feel awkward and there may be friction between you and any foster family, especially at first. Give it some time to see if things improve. If after giving it your best effort you feel your foster family is not right for you, or they do not accept you for any reason speak to your case worker and GAL. -Let your social worker or GAL know about any problems you are having. You have the right to contact your social worker and GAL anytime about anything. If everyone involved in your case (your social worker, GAL, and parents) all agree your placement should be changed, it is possible it may be changed without having to go to court. If a hearing is held, talk to your social worker and GAL about attending so the judge can hear from you about why the placement should be changed. L. How long will I be in foster care? The amount of time spent in foster care is different for each child. Many people—the judge, your social worker, your parents, your GAL and others—are working to get you out of care and back home as soon as possible. The best thing you can do is to tell your social worker, GAL, and the judge, what you want and what is important to you. M. What are my options for leaving foster care? Most children return home to their parents, but if your parents or other caregivers can’t provide a safe home for you within a period of time (usually less than two years), then your social worker will explore other ways for you to live permanently in a family. LEGAL GUARDIANSHIP: Some children are placed with relatives or family friends who may become your legal guardians, allowing you to still be with family, even if not your parents. ADOPTION: Some children may be adopted by a relative, their foster family, or another family who wants to adopt a child. PERMANENT FOSTER CARE: You may live permanently with your foster family, but not be adopted by them. You may remain with the same foster parents (or in another living situation) until you are 21 years old. If you are still in foster care when you reach 18, you can choose to leave. However, make sure you understand what you are giving up if you leave foster care before age 21. N. What happens if I’m adopted? If you are adopted, your adoptive parents become your parents for all purposes. Normally, when you are adopted, your birth parents’ legal right to contact and visit with you ends. However, if your adoptive parents, GAL, and judge (and you!) agree it would be good for you to continue to have contact with your birth parents, the judge can make a “Post-Adoption Contact and Communication Agreement” (PACCA) part of your adoption. » If you are adopted at age 16 or older, you may still be eligible for some Independent Living services. Contact your social worker, Independent Living coordinator, or GAL. O. Should I leave foster care at 18, or stay? If you choose to stay in foster care through Fostering Futures until you turn 21, you will continue to be eligible for assistance with housing, education, career training, living needs, and other benefits. You will also be eligible for college grants and scholarships specifically created for youth in foster care (see pages 18 and 40 for more information). If you leave foster care at 18 but decide you want to return, contact your social worker. » BEFORE you turn 18, be sure you understand all the programs and benefits for youth who remain in foster care until 21. -Your social worker must help you to develop a “Transition Plan” at least 90 days before you leave foster care if you will be 18 or older when you leave. You decide what goes in this plan, with the advice of your social worker and other adults you trust. -Discuss all the educational funding options available to you before you decide whether or not to leave foster care. -Your plan should include information and options about housing, health care, education, employment — and finding a mentor. P. What if I don’t agree with my transition plan? You have the right to appeal decisions relating to delay, denial, or termination of services. If your social worker says can’t get services you believe you need or are entitled to, you can appeal to the commissioner. Talk to your GAL about appealing. You are entitled to assistance in filing and filling out the Appeal form. Q. My parents’ rights were terminated, and I have not been adopted. Can I ever get back together with my family? If you (or a sibling) have not been adopted (or in a pre-adoptive home), are over 14, and it’s been two years or more since your parents’ rights were terminated, it may be possible for your parents’ rights to be restored. Tell your GAL, your social worker, or the judge that you would like to explore this possibility. - Once you turn 18, you may have any relationship with your birthparents you wish and can arrange with them. Some youth who choose to remain in foster care till age 21 may be able to live in their birth family’s home while in Fostering Futures. - If you are over 18 and have not been adopted, it may also be possible for your parents to adopt you as an adult, so that you are legally related to them once again.